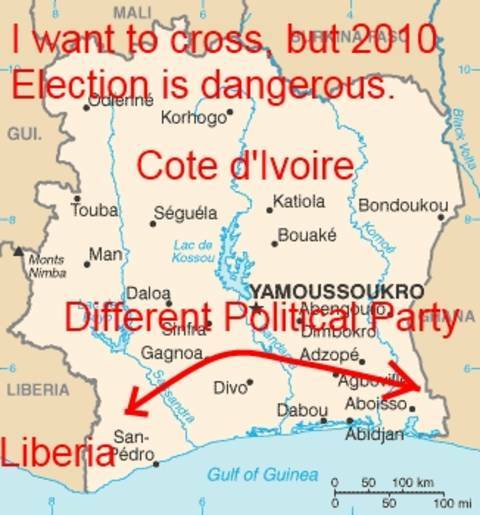 The 2010 Cote d'Ivoire Election has increased the danger of travel to Liberia, there is a risk of being involved in civil war. I hung around too long in Grand Bassam, Cote d'Ivoire, then not quite thinking, I made a decision to go visit an old girlfriend in Cinkasse, Togo. The election was just starting, and everyone said there would be no problems. When Cote d'Ivoire held a long delayed presidential election in October followed by a runoff poll on November 28 between Gbagbo and Ouattara. The U.N. declared Ouattara as clear winner, but both men had already declared victory and had themselves sworn in by loyalists. There is presently in December of 2010 two President, and makes both political candidates ready to start a civil war. Today is December 14, 2010, I am in Ho, Ghana waiting for Christmas, and New Years to pass, I also need to go to Accra to get a Liberia Visa, but can also attain one in Abidjan, but the process is questionable. Enter Abidjan, wait and slowly move maybe 100 Kilometers, ready to retreat if the next distance of 100 Kilometers is dangerous. Try to make the whole distance to Liberia in one day, then enter Liberia the same day. Fly from Accra, Ghana to Monrovia, Liberia, the cost is 400 Dollars. Fly from Abidjan, but the cost is 700 Dollars. Go the other direction through Nigeria, if I can somehow talk Nigeria into giving me a Visa without returning to the USA. I could send my passport to Briggs Visa service by overnight delivery and have it sent back.